Yesterday, at the end of our session, Yuki gave me a present. If you’ll recall, Yuki is the girl who has been selected to represent Miyoshi JHS in the county speech contest later this month. She decided to give me a late birthday present, which she made herself. 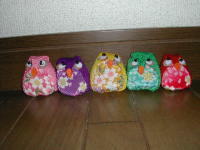 You can see them in the picture: five wee beanbag owls made from kimono silk remnants. 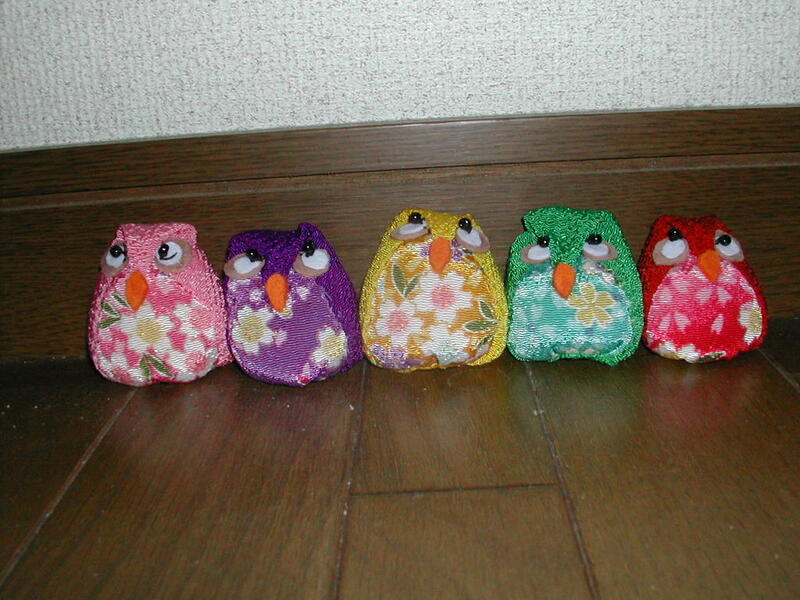 Owls are lucky in Japanese lore, and because they’re beanbags, Yuki has requested that I learn how to juggle them. I shall do my best! I was really touched that Yuki thought of me, and that she hasn’t started to hate me for all the speech practice I’m making her do! We just had the opening ceremony for the beginning of the school term. I remember standing in the same ceremony last year wondering if I’d be standing in the same place in a year’s time. Happily, it turns out I was. But this year, there is no question: I will not be standing in the same spot this time next year. My JET tenure at Miyoshi will have ended. To know for certain like this is not a sad feeling, but neither is it a happy one. Certainly not! Looking around me today at the kids, I wondered, for maybe the 500th time, how I’ll ever leave here. But I know I will. It’s time to move on, and time to make way for someone new to come and live their dream. From now on, until next March, the days will only get colder. We’ll have a mad, warm month in September, and then the smells if autumn will fill the air. It’ll be time to get the nabe pot out, turn on the space heaters, and huddle under the kotatsu. The kids will settle into this marathon term, the ALTs will plan Halloween and Christmas parties. I like the term. There’s always something going on. We also just had an earthquake drill. This part of Japan is expecting a major earthquake right about now. So drills a mandatory at the beginning of each term. Remember fire drills? How they were conducted only very occasionally, but we were never told? Well, they tell the kids. There’s no alarm or siren. The Kyoto-sensei (vice principal) gets in the tannoy and says “Get ready, the earthquake will start soon”. You hear chairs being scraped back in preparation. The special needs teachers bring down our wheelchair-bound student at this point to avoid the rush. The a minute later “Ok, the earthquake has begun. Get out!”. And the kids run downstairs out into the sports ground. I mean, drills are great, but the upcoming Nankai-jishin (as it’s called in Japanese) is hardly going to announce itself before it arrives: “Listen up, mortals! I’m on my way! In about a minute, I’m gonna move the earth so hard, you’ll barely be able to stand, and your school will collapse around you. Better get your asses in gear if you want to live!”. No. It’s just going to happen. And when it does, the school kids are gonna freak cause no-one told them. Sometimes Japan is too efficient for its own damn good.